The first time you buy your family sleeping bags you can be forgiven for feeling confused by all the temperature ratings. You’ll find Upper Limits, Comfort Ratings, Lower Limits, Extreme Temperatures, 1 Season, 2 Season, and so on. These ratings are there for a reason, but it does make buying your family a sleeping bag a little confusing, and getting the wrong sleeping bag could mean cold nights in the tent. 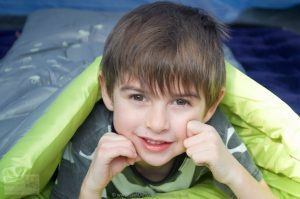 We help demystify things to help you choose the right sleeping bags for your family. Which Sleeping Bag Temperature Rating? The temperature ratings that come with sleeping bags are a rough guide. The best guide to look at is the Comfort temperature. The Comfort level is the temperature that the sleeping bag should be comfortable without the need for any additional blankets. If a sleeping bag has an Upper Limit, that will be the temperature when you will start to feel a bit warm in it. If the temperature reaches or falls below the Lower Limit, the sleeping bag will start to feel very cold. Ignore the Extreme temperature. The sleeping bag will not be usable at this temperature. This is the temperature when you are likely to get hypothermia! Sleeping bag temperature ratings are just a guide, and what feels warm to one person may feel different to another. Remember that kids can get hotter and colder quicker than adults. This is supposed to be the temperature that a ‘standard man’ would be comfortable without sweating, with arms outside the bag and the bag unzipped. I say ‘supposed’ as all of us are slightly different – a ‘standard man’ is supposed to be a 25-year-old weighing 73kg and is 1.73m high….that’s not me 😉 In other words, if it is any warmer than this temperature, then the bag will be too hot. This is the temperature a ‘standard woman’ (again, this might not be you) can expect to sleep comfortably. The temperature that a ‘standard man’ (so perhaps a slightly lower limit than a ‘standard woman’) can sleep for 8 hours in a curled position without waking. The minimum temperature to use the sleeping bag by a ‘standard woman’ for six hours without dying from hypothermia….though some frostbite is still possible (oh, great!). This is the emergency-last-resort-temperature. What are Sleeping Bag Seasons? 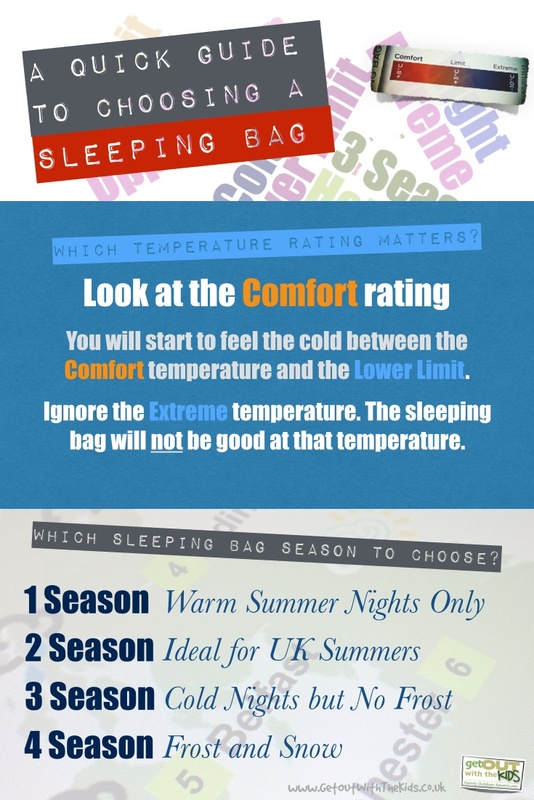 As well as temperature ratings the sleeping bags are put into ‘seasons’ to help make it easier to choose the right bag. Unfortunately, the sleeping bag seasons don’t nicely map on to the actual seasons. Here’s our guide to sleeping bag seasons. Warm Summer Nights Only 10 °C or higher Best for Summer only and may be rated for the coldest temperatures of about +4 to +5 degrees. A lot of kids sleeping bags are Summer only. If you’re summer camping in Europe, then a 1 Season bag is ideal…and in fact, you may not even sleep in it. A warmer bag would be too hot in those conditions. Cooler Nights 5 °C or higher Ideal from Late Spring through to Early Autumn.  For most UK family campers, a 2 Season bag is adequate (along with some other measures to keeping warm in the cooler months). You would not want the temperature to get close to zero. 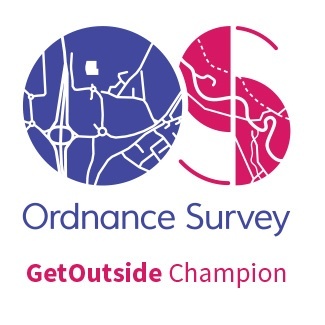 Cold Nights but not Frosty 0 °C or higher If Spring and Autumn camping is what you are doing, then go for a 3 Season bag. Most of these sleeping bags will keep you warm on cold nights and not too hot on milder nights (though you might need to have it unzipped). Their lower limit may be rated from zero to -5 degrees, but you will start to feel the cold then. Frost and Snow -5 °C or higher Winter bags that are suitable for very cold Winter nights down to -10 degrees. If you are interested in a sleeping bag for winter, read our guide by clicking here. We added the temperature rating to the table above to give you a good idea of what sort of temperature each sleeping bag season is best for. Which Sleeping Bag Season should you buy? The 1 Season sleeping bags are cheaper, but they are only good on warm summer nights. In the UK we can’t guarantee warm summer nights every night. We recommend if you are only taking your family camping in the summer you should get a 2 Season sleeping bag. If you want to start camping a little earlier, such as the May school half term, or a little later into September, then get a 3 Season sleeping bag. If someone in your family feels the cold, a 4 Season sleeping bag would be a better option. Unless you get a very expensive backpacking sleeping bag, a 4 Season sleeping bag will take up a lot more space when packed, so check you have enough space in your car. What about sleeping bags for children? There are a lot of cheap sleeping bags for kids, usually with printed characters on, that don’t display any temperature ratings at all. This type of sleeping bag is a 1 Season. They are fine for sleepovers at their friend’s house, or if you are just camping out when it’s warm and dry in the summer. ‘Proper’ kids sleeping bags are usually 2 Season. There are measures you can take though to make sure your children stay warm during the night. Click here to read our guide to setting up your sleeping area properly. You can also buy a sleeping bag thermal liner if you are camping on the odd occasion when the weather is colder without having to buy a whole set of new sleeping bags. If you think you won’t remember which rating to look at when choosing sleeping bags, then print out our quick guide below and take it with you to the camping shop. Beware of some shops selling sleeping bags that look warm but are not rated for cooler nights. Also, avoid being sold really expensive backpacking sleeping bags if you don’t need it and are just camping with your car. Hi, we have a 200gsm sleeping bag, that has an extreme rating of – 14C, and 0.6C for comfort. Not sure what this means in terms of season rating…. Help ? It sounds like a 3 season sleeping bag. Hi, it’s a very useful article, thank you. 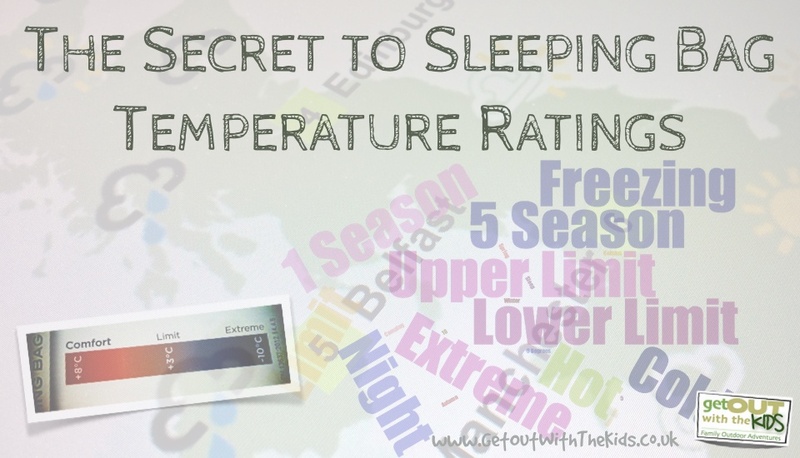 Just one question: what does temperature mean at the ‘guide to sleeping bag seasons’ table? Is it the ‘comfort temperature’? So if I have a sleeping bag with the following rating: comfort 5 °C, limit 0 °C, extreme -15 °C does it mean I have a 2 season sleeping bag? I am just about buying a sleeping bag to my 4 years old but until now I could not find a 3 season one for him. I really like Kelty’s Big Dipper however that is a 2 season one, with temperature rating 30 / – 1 °C. I myself has a sleeping bag with the rating above, so it would be useful to compare the two ratings. Good question. That’s the typical night temperature. You want to make sure the Comfort Temperature on your sleeping bag is good for that, for the time of year you plan to go camping. It’s not an exact science, but yes, I would class a sleeping bag with a comfort of 5C as a 2 Season sleeping bag. Fabulous site, so glad I found you. Have passed you onto my daughters too ? Well the ‘3 Season’ bit means that the sleeping bag should be good from Spring through to Autumn. Although in our experience, that’s usually Late Spring through to Early Autumn for the best comfort. The other part of the name, Energy 350 for example, is whatever the manufacturer wants to call it. Typically the number identifies different models in the range, with higher the number, the warmer the bag – though that isn’t always the case. Some manufacturer’s use the number to hint at the bag’s weight, which is important if you are backpacking. A common trend is to use 100 for 1 season, 200 for 2 season, and so on. However, this isn’t standard nor official. So a number of 350 hints the bag is 3.5 seasons, i.e. slightly warmer than 3 Season but not quite a 4 Season. But be careful using this number, since the manufacturer can call it what it likes. So a ‘350’ may just be a 3 Season, and the number has more to do with marketing than describing the bag. So, always go by the official temperature ratings. I’ve read this with interest, thanks guys! Can someone tell me what I should pay for a 3 season sleeping bag? Sounds silly I know, but they have some on ebay from under £10…….does the old saying ‘you get what you pay for’ ring true here? Or is a 3 season bag, well, a 3 season bag?? Hi Sonia. Yes, under £10 is very cheap for a 3 season sleeping bag. That’s normally a 1 season price. If they are genuinely the 3 Season Standard, then that’s a good buy. It may be that someone is selling off last season’s stock. However, I would be cautious as it’s easy for someone to say 3 season. If you can see from the pictures, look for things like stitching to stop the insulation moving around, and insulation baffles over the zip. 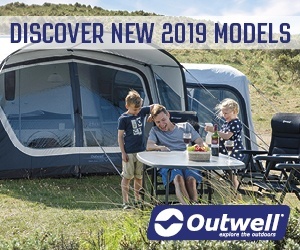 Personally, if they are not a well-known brand and model, I would stay clear at that price, as it sounds too good to be true. Hi Gav, thanks for that, its pretty much what I was thinking….I’ll stick to brands I recognise!